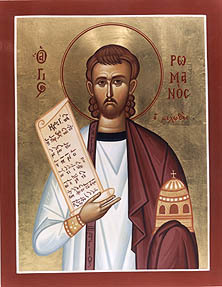 Saint Roman the Melodist (also Romanos and Romanus, from Greek Ρομανὸς), a Greek hymn-writer called "the Pindar of rhythmic poetry," was born at Emesa (Hems) in Syria. His feast day is October 1 with the feast of the Protection of the Mother of God. The popular patron of church singers, St. Roman, was born in Emesa in the latter part of the fifth century. Whether or not his Jewish parents converted to Christianity is uncertain; Roman himself was baptized as a young boy and developed a great love for the house of God. When he came of age he served as a verger, lighting the lamps and preparing the censer. After moving to Beirut, he was ordained to the diaconate and assigned to the Church of the Resurrection. He had a rather mediocre voice, but his pure and simple heart was filled with love for God, and to assist at the church services gave him the greatest joy. During the reign of Emperor Anastasius I (491-518), the young deacon moved to Constantinople. He led an ascetic life of prayer and fasting, but in his humility he thought of himself as being rather worldly. He had a special love for the Mother of God, and would go at night to pray in the Blachernae Church, which housed the precious omophorion of the Holy Virgin. The saintly Patriarch Euthemius loved Roman for his many virtues, and paid him the same wage as those singers and readers who were more educated and more talented. The latter resented this and derided Roman for his evident lack of musical and theological training. Roman himself was painfully aware of these defects; he longed for a melodious voice worthy of leading the faithful in praising God. It was the day before the Feast of Our Lord's Nativity, and Saint Roman was assigned to lead the singing that evening at the All-Night Vigil. He was responsible not only for the singing but also for the text of the hymns. After everyone had left, he remained in the Blachernae Church and tearfully entreated the Mother of God to help him. Exhausted, he fell asleep with his sorrow. In answer to his prayer, the Mother of God appeared to him in a dream. She handed him a scroll and said to him gently, "Here, eat this." Roman did so and awoke, overcome with joy and the lingering presence of the heavenly visitor. When it came time that night for him to sing, Saint Roman received the patriarch's blessing and, vested in a special garment reserved for the principal singer, he stepped onto the ambo. He began to sing: "Today the Virgin gives birth to Him Who is above all being . . ." The emperor, the patriarch, the clergy - the entire congregation listened in wonder at the profound theology and the clear, sonorous voice which issued forth. They all joined in the refrain, "A new-born Babe, the pre-eternal God." Later, Saint Roman told the patriarch about his vision, and the singers who had made fun of him prostrated themselves in repentance and humbly asked the Saint's forgiveness. It should be noted that the kontakion as we know it today—a short hymn honoring and describing a particular feast or saint— is only the prologue or proomion of a full kontakion which, at the height of its development in the sixth century, was a poetic sermon composed of from 18 - 30 verses or ikoi, each with a refrain, and united by an acrostic. When it was sung to an original melody, it was called an idiomelon. Originally, Saint Roman's works were known simply as "psalms," "odes," or poems. It was only in the ninth century that the term kontakion—from the word kontos, the shaft on which the parchment was rolled—came into use. With the Nativity Kontakion, which has been dated to the year 518, Saint Roman began a period of prolific creativity. Altogether, he wrote as many as one thousand kontakion, celebrating feasts and saints throughout the liturgical year. In the words of one scholar, Saint Roman's compositions successfully combined "the solemnity and dignity of the sermon with the delicacy and liveliness of lyric and dramatic poetry." Because Saint Roman is commemorated on the same day as the feast of Protection, he commonly appears as a central figure in the icon of that feast, even though there is no historical connection (the event celebrated by the Protection icon occurred in the tenth century). Although in more recent icons Saint Roman is depicted as a deacon standing on the ambo, Russian church musicologist Johann von Gardner points out that in the oldest icons he is more accurately portrayed wearing the short red tunic of a singer and standing on a raised platform in the middle of the church. for you made it lovely with beautiful hymnody. that we may cry out to you: "Rejoice, all-blessed Father, beauty of the Church." like an inspired heavenly trumpet. and shone on the world as God's poet. We lovingly honor you, righteous Roman. Karl Krumbacher, Geschichte der byzantinischen Litteratur (1897). 1 On the question whether Anastasius I (491-518) or II (713-716) is meant, see Krumbacher, who is in favour of the earlier date. Adapted from the Wikipedia article, "wikipedia:Romanos." Venerable Romanus the Melodist, "Sweet-Singer" - from OCA web site. Romanos the Melodist - from GOARCH web site. This page was last edited on October 3, 2016, at 03:51. This page has been accessed 71,177 times.